“The moonless, starless sky was bright…”. The first line of this book by Alexis Okeowo delicately synthesizes the common storyline of all the real characters in the volume and their reactions to the scourge of violent extremism in Africa. It captures resisting and overcoming a dark horizon, without apparent escape routes or any glimpse of light. In her first published book, Okeowo tells us her stories about travelling to Uganda, Mauritania, Nigeria and Somalia, where violent extremism has shattered the lives and dreams of millions of people. In first-hand accounts, she illustrates the protagonists´ strong will to overcome any obstacle, as ordinary men and women, with the strength and courage necessary to change their lives and their communities. The book is also, by itself, a personal journey of the author to her origins, deepening her hybrid identity. Okeowo’s family background is Nigerian although she was born and lives in the US). Moreover, the book emphasizes many small details that make up a rich and inspiring mosaic, transporting us to the real Africa of millenarian cultures and religions, of customs and ordinary people, and of the use, abuse and tortuous interpretation of religions by a few to subjugate the many. In short, Okeowo asserts herself as a contemporary Cicerone, guiding us to the depths of the contemporary African soul, and to the terrible and cruel waves of extremist violence that have plagued the continent in recent years. In an eloquent and inspiring way, she leaves space for the reader to join her, without excessive details, in this trip to assimilate and process what has been read. The book is structured in two parts. The first is dedicated to the political, social and demographic contextualization of each of the situations, where chaos and political complexity affect the lives of ordinary people. The second focuses on the response of the protagonists facing terror and injustice. Thus, the author, in a didactic but not simplistic tone, reminds us of some of the cruelest conflicts that have affected the African population in this century, from a human point of view, as recounted by direct witnesses of barbaric acts. She ranges from the kidnappings of Eunice and Bosco by the Lord’s Resistance Army in Uganda, to Biram’s exemplary struggle against slavery in Mauritania, the kidnapping of thousands of girls by Boko Haram in Nigeria, and the strength of Aisha to survive in the stifling atmosphere of Mogadishu under pressure from Al-Shabab. In short, all of them are unequivocal models of resilience and overcoming violent extremism, sometimes pitted against their own communities and customs and even themselves. It is equally interesting, from a more analytical and professional point of view, that the different factors appear as a common thread to these stories of resilience in the African continent, in line with many others in Europe and other parts of the world. Perhaps we should start highlighting the origin and / or justifications of these forms of violent extremism: a tricky interpretation of religion to subdue a population. We find in this book examples of the ad hoc and self-interested interpretation of sacred texts by Koni´s Christian extremism and his Lord´s Resistance Army, the supposed justification of slavery by Islamic texts in Mauritania, and the Islamic extremism of Al-Shabab in Somalia and Boko-Haram in Nigeria. In all these cases, a “dictatorship of fear” develops, where the victims of extremism must first break the mental chains that imprison them in an identity that is not theirs and that prevents them from aspiring to freedom. Therefore, we find several profiles of ordinary people affected in different ways by violent extremism in these stories, all of them models of active resistance and exemplary resilience, although it is necessary to give a special place to the role of women, who are doubly victimized and whose efforts to resist are doubly difficult in this environment. In the case of the children kidnapped by the Lord´s Resistance Army, Bosco and Eunice, Okeowo brilliantly portrays how their identities change dramatically from victims to victimizers or forced accomplices in barbarism. This alienation, as in all cases of adhesion to extremist groups, forced or not, is the result of a long process that implies the perpetration or participation in violent acts and a rejection of the community of origin of the victims. The community, therefore, has a crucial role in propitiating or hindering the processes of disengagement. This rejection or mistrust of the community of origin is especially relevant in the cases of the girls abducted by Boko Haram. Once released and reunited with their families and community, some return to the extremist group. This seems incomprehensible for those unconnected to this tragedy, but for some girls it is the only way out after the rejection they have experienced in their own communities. Similarly, turning to the thousands of cases of slavery in Mauritania, the community acts as a silent accomplice, witnessing the use of certain Islamic texts and their interpretations as a justification and legitimization of slavery, violence and racism, deeply settled in the society. The assumption of an identity exclusively based on religious interpretation in the case of slavery in Mauritania, or in the weight of the actions committed during the kidnapping period in the case of the LRA´s kidnapped children, makes the mental chains act as a psychological jail, stronger even than the pressure and violence exerted by the perpetrators. We must not forget that bonds and connections of friendship or kinship between members of extremist groups and the community itself are found frequently. The tentacles of the violent ones sometimes reach to the next door neighbor´s house or to a family member. This factor undoubtedly facilitates the reactions of distrust, rejection or repudiation of the victims and affected families. But it is also true that it is within these communities that courageous individuals are found, and that they seek out, gather and empower each other, to build the pillars of a resilient community that fights for freedom. It is also important to note the relevant role of governments and authorities in all these cases. In the first place, the very management of crises by the authorities frequently strengthens support for violent groups and helps them to flourish, as adopting repressive and coercive measures in the fight against terrorism directly affects the population in several cases. The bombing of civilians in search of terrorist niches or massive police raids on some neighborhoods and villages generate backing or justification of the extremist groups by the population. On the other hand, the lack of reaction from the authorities, in particular silencing and hiding the victims, generates a double victimization that is difficult to overcome in all the cases the book describes, even leading to transgenerational trauma of the kind Bosco, Eunice and their little son suffered. In short, the structure of the book, its literary quality, the undisputed relevance of its direct sources, and above all the sensitivity and human qualities of Okeowo make this book worthy of the many awards it has received. Furthermore, all these characteristics make us think of this book as an effective tool for raising awareness in schools about violent extremism and social polarization. 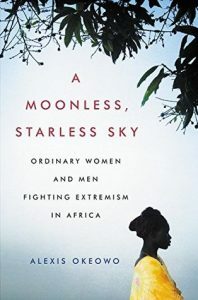 In sum, “The moonless, starless sky” is an excellent work and essential reading for everyone interested in violent extremism in Africa and needing to reinforce their faith in humanity.